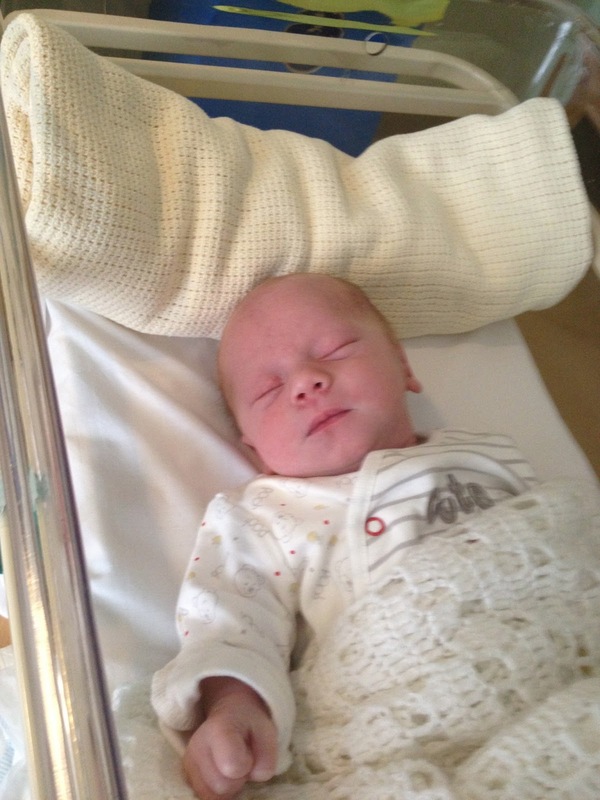 Mummystartinhout: My boy and his traumatic first few weeks! Hello! I can't believe it has been so long since my last post. Having a newborn takes up a lot of time! I knew I'd be busy, but I can hardly find time to do anything! Charlie is now 5 weeks, I can't believe how fast the time is flying, as when I was pregnant and desperately waiting for him to arrive, the days dragged! He is fabulous and I am totally in love with him. The labour and delivery was pretty awful (blog post coming soon about that!) but I can now not imagine life without him, even if I do want to cry when he screams all day! Although he is getting better at that now. His first few weeks have been pretty traumatic actually. Three weeks ago today it started to snow late on at night. Hubby and I were up about 2am feeding and changing Charlie and the lights kept flickering on and off, eventually about 3am they went off and didn't come back on. The power was out. We didn't think anything of it and assumed it would be back on soon and that some snow was affecting the lines. However, it wasn't back on in the morning when we got up. So we boiled some water on our gas hob and were able to have hot drinks. We also had the step-daughter staying with us and since there was quite a lot of some by this point, she had a snow day as did the hubby. You might remember, we live in the Isle of Man and where we are it's quite remote, although only 10 mins from the village. Our road often gets closed for a few hours when it snows and we are used to that. Anyway, they closed our road and we once again, assumed that power would be restored shortly. By tea time Friday it had still not come on and by this point we were starting to get cold. Even though we live in a cottage, we have no coal or log fire, just oil central heating, which wasn't working due to no power! Our phone batteries were starting to die and we couldn't get out as we had between 5-12ft snow drifts all over the road. Our car was nearly covered right to the roof in snow and so there was no way out. Anyway, we all snuggled down in the lounge with candles and tried to keep warm. Power still wasn't restored by Saturday morning. I started to panic at this stage as Charlie was only 17 days old and he was starting to feel cold, despite numerous layers and blankets and being kept in my arms. He then started being sick - an illuminous yellow coloured sick and he wouldn't feed. I had turned my phone off on the Friday so I had a tiny bit of power left, so we rang hubby's dad and said please could he see if they could get the police or someone to come and get us out as the baby was unwell. That was about 8.30am. All we could do now was wait. After that we went round to our landlady's farmhouse; she had a gas fire and told us to go and sit round it and try get warm. To be quite honest, the heat coming from it was pitiful! But it was better than nothing. Anyway, I was worrying and waiting and trying to get Charlie warm and had given up hope of being rescued really. And then, two god like figures appeared at the door! Two coastguard men had arrived to rescue Charlie and I! I have never ever been so happy to see two men in my life! They said we had two options - helicopter would hover above and winch us up or we could wait for their 4x4 which was slowly making it 's way up our road behind a snow digger! I decided to wait as I didn't fancy a 17 day old baby being winched up to a helicopter! In the end it didn't take long for the digger to make some progress and they asked hubby to carry the baby through three fields to meet the waiting 4x4 as it couldn't get any further. So we trudged through the fields which by this point, because of the drifting, had 4ft of snow at some parts, me being only just 5ft found that walk very difficult and never would have managed it carrying Charlie. We got to the van and had to say goodbye to hubby as there wasn't enough room for us all, and off they took us, blue lights and sirens and all to the hospital! Looking back now, if we hadn't had been rescued, god knows what would have happened to Charlie. When we got to A&E, his temperature was between 34-35, which was quite cool. But they quickly warmed him up with a heat blanket and we were admitted to the children's ward so they could monitor him and get him back feeding. Despite feeling extremely pleased and happy we'd been rescued I now worried about the hubby and step daughter. Particularly as the hubby is diabetic and we were running out of food and couldn't cook anything anyway! On the Sunday, the coastguard man who had rescued us, added me as a friend on facebook and once again, if he hadn't I don't know what would have happened as he messaged me to say had hubby managed to get out, I told him no and he gave me a number to ring and tell them hubby was stuck. I did and a few minutes later he replied saying he had been tasked to go and rescue the hubby and step daughter! It took hours and I was pacing the hospital room, but they eventually arrived to me at about 4pm Sunday afternoon! Our power was still out and the snow by now was even worse and there was no way we would have got out of there anytime soon. The stepdaughter went off to her mum's and the nurse allowed hubby to stay in the hospital with us. They were happy that Charlie was ok on Monday afternoon and discharged us, but now we were snowed out! So we went and stayed at the in-laws. Our rescue would not have been possible without hubby's sister. They haven't always seen eye to eye and to be honest we didn't really talk to her properly until this. When we rang his dad on Saturday morning, she got involved. She contacted the police, who quite frankly, were a waste of time. I know they had a lot to deal with but they really didn't help. She then contacted someone she knew who volunteered for the coastguard who was off duty. He got in touch with someone who was on duty and our rescue came from there. If she hadn't have helped us, god knows what would have happened. We owe her a lot. 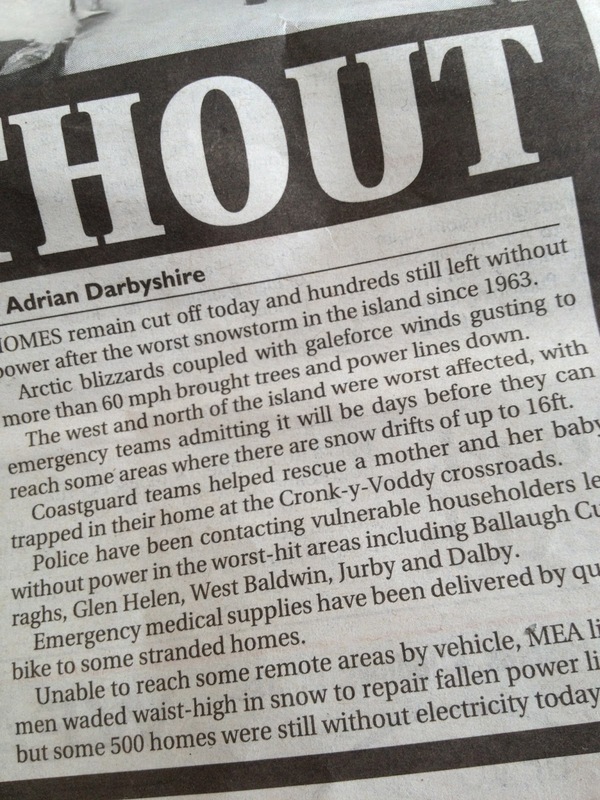 We also owe the wonderful volunteers from the coastguard a lot too. They went above and beyond for us! They have even kept in touch with us, asking how Charlie is getting on. They are wonderful men! So poor little Charlie has had an eventful start to life. But thankfully all turned out ok and we are now safely back at home with full power! Incidentally, the power didn't go back on until Monday afternoon, from 3am Friday morning. The poor electricity men worked very hard those few days and are still dealing with the after effects now. I have never ever seen snow like it in my life. Driving down our road in the 4x4 van there was 15ft of snow on either side of us, it was like nothing I've ever seen. Below are a couple of pictures for you to see what it was like, although they do not do it justice at all! We even managed to make the front page of the Isle of Man newspapers, so at 17days old, Charlie became famous! I've taken lots of newspaper cuttings and clippings and I am going to make a scrap book, so when he's older he can see what happened to him! 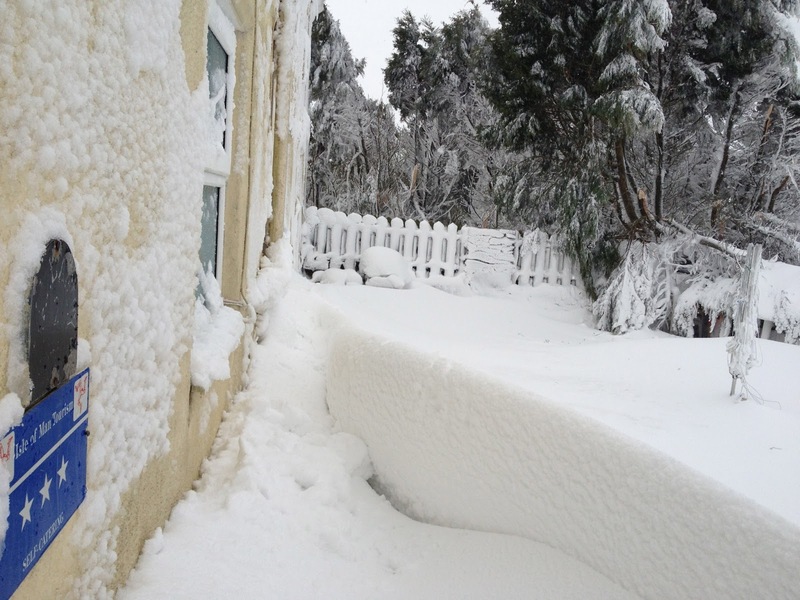 The snow in our garden! Somewhere under there is a table and chairs! 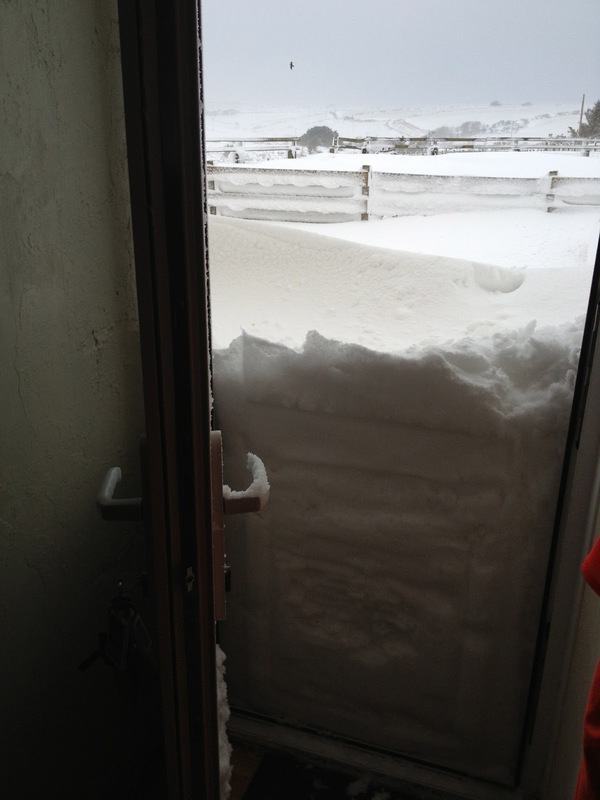 Outside our front door - the window is 4ft up! This is the road we live off - normally a very busy main road around the Island! You can see the near 20ft wall of snow on the left side!